Grilled Pizza: You could offer a build-your-own pizza bar and grill them up fresh for your guests. Pro tip: To keep the orders from getting backed up, consider borrowing an extra grill or two depending on the size of your party! Unique Seafood Flavors: Rather than the usual burgers and chips, why not do a southern-style shrimp boil? Or better yet – serve fresh and hot fish and chips! Paella may be time-consuming, but it’s a delicious meal that can feed a crowd. Cold appetizers: In an effort to beat the heat, serve cold appetizers to your guests. Watermelon is a thirst-quenching and refreshing option, and for something completely different, consider offering guests shot glasses of cold soups. Brisket: Everyone loves barbecue, but what about changing it up a bit and serve smoked brisket instead! The toppings are similar, but the flavor is unique and a little different. As an alternative, you could do pulled pork instead. Roast Pig: Don’t be intimidated -it’s easier than you think! And you can always hire professionals to help. Your guests will be impressed and wowed by the flavors. Flavorful chicken: Let’s face it: there are few things easier or more economical than grilled chicken for a crowd. If that’s the way you go, change things up by serving high-impact flavors with your chicken, like using a Sriracha marinade. Hydration station: Your guests will always need something to quench their thirst, but especially if your event is outside in the heat, be sure to include truly hydrating beverages along with the soda and beer! Try unique iced tea or lemonade combinations for added interest. Summer is a fantastic time of year to cater a party. The flavors of the season are so fresh and readily available. 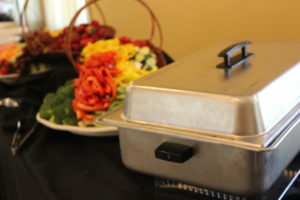 We would love to brainstorm with you how to cater your summer events with the best flavors local produce has to offer. Give us a call to find out more!